Separate addons saved in the user space, for mods. Add a share option that tells the user what is needed to use the movie on another computer. Create a bundle that can be installed on the other computer to use that movie, that includes the addons needed and the movie file. Mood change dialogue no longer has advanced mode or improv timeline. Allow people to easily try the content in a theme bundle or in base version. On the settings menu, you can select a bundle to disable any content not in the bundle. Let people load movies that have a corrupted summary. Let people load movies from backup files (rather than having to do a manual restore). Having face morphs that are at 0% no longer prevent a character from loading when they are not present. Partial head look at lets one look and nod or shake the head at the same time. Updated tutorial help text and images. Fireplaces can now have the fire not burning in the grate, rather than always being on. Randomly created characters now should have matching hair colours, if there are multiple hair materials. Randomly created characters don't have silly eyebrows. 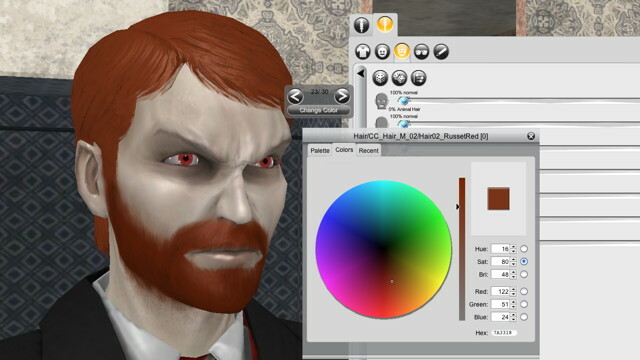 Randomly created characters have eyes with a material name containing one of "Cold", "Brown", "Blue" or "Green". No more snake eyes or red eyes by default. The Wall Customizer now appears in the same place as the Prop Customizer, and appears when left clicking on a wall instead of right clicking (which would give a 'change colour' menu if the wallpaper is tintable). Clicking on the wallpaper part of a Portal (a Door, Window or Fireplace) now shows the Wall Customizer rather than the Portal Customizer. Changing the materials on a Portal is now done by right clicking on the material in the main view, rather than having a list of 'change colour' options in the customizer. Ie it now works just like other props. Changed where snapshots are saved to (and let you change where they save to, and find them when you have taken them). Stock sets can now be sorted. Added support to allow modders to add additional character models with skeletons other than Male01 and Female01. When adding a user image to a prop, there is now an option to turn on Transparency, which makes the image transparent if it was saved with an alpha map, or gives it a transparent border if you have resized it on the prop. Gizmos are now semi transparent. Faster 'info' behavior to determine what actions are possible to interact with stuff on the set. Resizing 'say' activities before playing them works better. Modder's workshop: Sketchup import should now work better in situations where previously the import previewed, but then did not finish importing. Added Undo/redo to the direction controller in the lighting panel. Changed decal selected button to have a tick to make them easier to see. Using Door->Open or Close now rotates the animation around the correct spot so that the person's hand does not go through the door when they are standing with the door handle on the right. Added new sit down animations for sitting on sofas, that start facing away from the sofa to avoid silly turning around when it is not needed. Modder's workshop versions of new templates for Emissive primitives and Multiscreen. Nice one Ben! Sterling work, as always. Please everyone give it a thrash, and let us know asap if you find any issues ...knowing Ben, if there is anything, it will be hard to find. thank you, Ben, so much, and everyone else involved. EDIT: I just checked out the new addon license and have a couple of questions about it. I will start a new topic in the Modders' forum. I'm THRILLED to begin again using this software !!!! We very thank you for the improvements, a good and useful job . Go on, guys! P.S. : still have strange hairs colors on random actors (not a big deal). Talking about hairs, just a wish maybe for a next version: a "Change color" option. I'd love that! We all would love that. From my experience it is not possible because most hair use alpha transparency. In Moviestorm you can use the alpha channel EITHER for transparency OR for protecting areas from tinting -- but not both at the same time. Very Impressive, love all the improvements so far still sifting my way though it. to allow for cutting and pasting of text into the dialogue (enter to say) box? As I tend to use a lot of dialogue first scripting then having to retype the text into the dialogue box. ...to allow for cutting and pasting of text into the dialogue (enter to say) box? I've defiantly cut/pasted into the say dialogue in the past, and it appears to currently work. Are you trying to use hotkeys (control-x cut, control-c copy, control-v paste, or possibly command variations on a Mac, but try both)? The change is supposed to stop having two different hair colours, eg main hair and forelock, or hair and ponytail being different colours. I may have inadvertently changed this for 1.6; it is now the case that if one combines smooth alpha (ALPHA_BLEND) and TINTABLE flags, then the shader treats it as having ALPHA_BLEND and USE_MATERIAL_COLORS instead, ie no longer using the alpha channel as a tint mask. Will investigate further, and will hopefully be able to add some tintable hairstyles as a result. OK, thanks for the explanations and good job, Ben. Excellent work Ben, it is great to see so many fixes and logical feature updates being added. I had 65Radius point out CTRL-C CTRL-V works fine. I had been using R-click mouse. Great stuff Ben. Only 0.4 to go! That is awesome!!!!!!!!!!! Thanks so much, Ben. I'm blown away. So often I had wished for that! Such a small change with such an intense effect. I have to correct my answer above: We're closer than ever! Will investigate further, and will hopefully be able to add some tintable hairstyles as a result. Ho ho ho, I guess talking about that was a good idea . Cant' wait! great work on the new update, but a question... In the new update, it says you can set up modders licence. but I cant remember my password for my licence, do I need to delete that one first for this to work? Glad to see this update roll on out a my final are done.